Spring has sprung! For many of you its time to add new accessories to you wardrobe for the change of season. This can also be applied to your home. Welcome in the warmer weather with these five items. 1. The Nouveau throw pillows from Villa Home will add the perfect pinch of color you need to bring in Spring. The curvaceous lines represent the splash of a new season perfectly. 2. The Nate Berkus purple chevron area rug for Target is sure to add the right amount of trendiness to your space. Gold is all the rage right now so why not incorporate this fabulous trend into your space with a set of these century table lamps from Z Gallerie. 3. As the warmer weather continues to roll in you will be hosting a lot of gatherings and every great party needs a great bar cart! This Society Social bar cart screams Spring especially with over a dozen cheerful colors to pick from. 4. And finally, some paint. 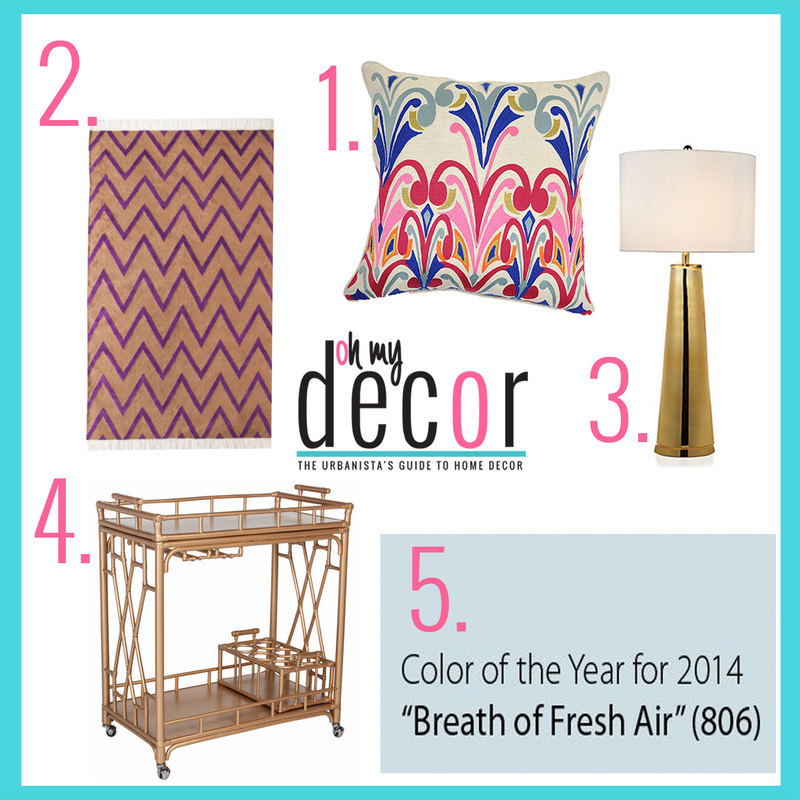 My favorite is Benjamin Moore’s color of the year for 2014 called “Breathe of Fresh Air”. Very subtle, yet refreshing. Appropriate, right? With these five items you are sure to be more than ready for the warmer weather. Not to mention, you’ll have the cutest spot out of all your friends.